What is the origin of Naam Traya Mantra? Or in which scripture this mantra is mentioned? The mantra is Om Achutaya namaha Anantaya namaha Govindaya Namaha. I don't know the correct form but these 3 names of God Vishnu are there in Naam Traya Mantra. I also got the Rishi and Chanda from internet but don't know in which scripture this information is found? These Mantras are found in the Padma Purana and are also used during Achamana by certain sects. Whoever recites the Three Names viz. Om Achyutaaya, Om Anantaaya, and Om Govindaaya sincerely and with dedication, none of the poisonous diseases or Agni- based frights/deaths would affect. Here, as one can see, the context is Samudra Manthana. But it is also quite possible that the Mantras are also found in some other scriptures as well. 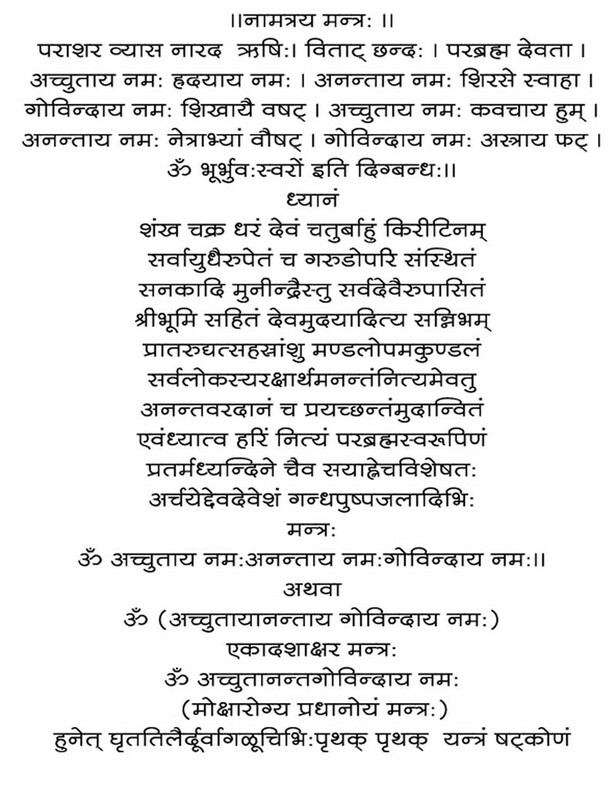 Note that there are three Rishis - Kasyapa, Atri and BharadvAja - mentioned as the seers of the Mantra. 1-2. I shall hereafter tell you about the excellent vow of the sprinkling with water, as told by Pulastya to the magnanimous Dalabhya. It destroys all faults caused by diseases. It gives auspiciousness. I shall tell it to you. Listen, O daughter of the (Himalaya) Mountain. It's references can be found during Samudra Manthan episode also. 2-7a. Seeing them running away Shankara said these (words): "O hosts of gods, hand over the poison to me. I shall quickly inactivate the great (i.e. severe) poison, viz. Kalakuta". > Saying so, that lord of Parvati, meditating upon Visnu in his heart and uttering the great hymn, took that fearful poison. By the power of the great hymn, that great (deadly) poison was digested. 16-21. Having meditated (i.e. when I meditated) with a concentrated mind upon that lord along with J§rl and Bhumi, having earrings of gold purified by fire, remover of all miseries, and on my having muttered the great hymn of the name and form (of Visnu) along with Mahalaksmi, all that poison, which was very fierce, which was the first one, which was fearful to all, which was (capable of) destroying all the worlds, was digested (by me) due to the three names of Visnu, the omnipresent one. He who, being restrained, would devoutly mutter the three names of Visnu, viz. Acyuta, Ananta, Govinda, beginning with Pranava (i.e. Om) and (also) ending with Om, has no fear of death, so also the great fear due to poison, disease and fire. The wise, restrained one, who would mutter the great hymn—the three names—does not have fear of Death; then from where else (can he have it)? Thus with (the muttering of) the three names I drank that poison. Not the answer you're looking for? Browse other questions tagged vishnu mantras identification-request .